We are among the oldest Specialized Wash & Restoration Rug Service Providers in Knoxville State-Tennessee, USA. We look for aesthetic beauty, intrinsic value, quality and price. Therefore, we can offer and assure you of the finest services at the most favorable prices. Our knowledge and work passed down to 3 generations. 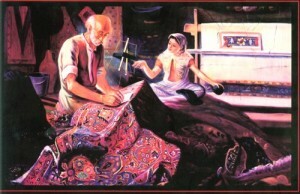 We take pride in our extensive experience and our set of distinguished Oriental Rug services. We are one of the few companies who Specialized in rug restoration services. Offering extensive cleaning methods which include dusting, hand washing, soft-water rinse, special & natural drying process with fringe cleaning. Personal home or company visit upon request. We have our own new and traditional cleaning, washing techniques for effective results. Use of professional and expert weaver who can repair & restore your rugs as well as brings your rug back to excellent condition. For rugs in stain-prone areas, we offer a fiber protection treatment that is 100% child and pet safe as well as wool friendly. We treat both sides of your rugs with a special 100% naturally child safe, pet safe and environmentally safe formula. This formula prevents moths from affecting your rugs by changing and making it unappealing to the insects. New Look Rug – The Place Where You Can Trust. 1429 Buxton Drive Knoxville TN 37922.